I got a friend request from Bianca Bosker on Wednesday night. I’m Bianca Bosker, one of just three on Facebook, so the notification took me by surprise. What followed spooked me: When I finally scoped out this new Bosker at 8:30 a.m. on Thursday, I found myself staring back at me. Someone had created a Facebook profile under my name, with my picture, and with all my personal information -- and then immediately friended me. This new Bianca had the same cover photo as the old Bianca (aka me); an identical list of jobs, schools and affiliations; and had “liked” the same pages I’ve “liked” -- "Global Disaster Relief on Facebook," "Roger Ebert," and even Switched, an AOL tech site shuttered over a year ago. Even more disturbing was the fact that “Bianca Bosker’s” most recent status update was word-for-word, period-for-period, my most recent status update. Only the Facebook profile photo was different. The fake account featured a picture of me that’s nowhere to be found on Facebook, but appears as one of the first results in a Google Image search for my name. 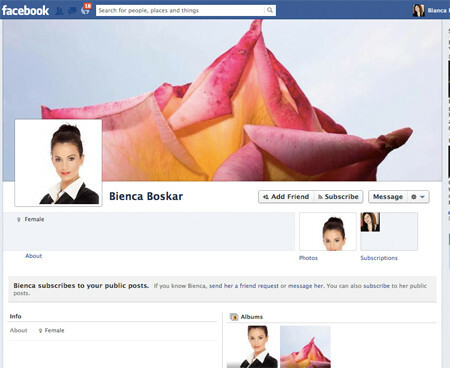 Ten minutes after Bianca disappeared, I received another friend request: this time, from Bienca Boskar, a stockphoto brunette who had subscribed to my updates and, once again, swiped my cover photo. By this point I had completely lost my cool. I felt like I’d received a prank phone call from someone who knew where I was, what I was wearing, and the last thing I’d said out loud. I realized I was being watched. But back to the bogus Bianca. What’s going on here? Facebook, by its own admission, has around 83 million fake accounts, many set up by scammers looking to make a buck, but this didn’t have the trademark signs of a being created by a bot setting up personal accounts en masse. And of course, impersonation on Facebook is common enough to appear on Facebook’s FAQ, but I’d assumed my friends and I, by our mid-to-late 20s, had outgrown such pranks. Besides, why would someone fake being me -– and then friend the real me? I reached out to several security experts, who were equally baffled by the turn of events. The precision with which my profile had been copied suggested to Alex Horan, senior product manager for computer security provider Core Security, that a human, not a script, had created the account by hand. He surmised that the large number of people who subscribe to my updates –- about 221,000 at most recent count -– might have motivated someone to create a fake profile to attract their own follower base, which they could eventually spam and “friend” in order to extract personal information to sell to advertisers. That theory fell apart after none of my friends or followers reported friend requests from my alter-ego. A Facebook message I sent to Ms. Bienca Boskar has gone unanswered, but there are other ways I could try to track down my fake self. Facebook spokesman Fred Wolens noted that users can file a request with the social network to receive any data Facebook has on record about the person who created an impostor timeline. Roel Schouwenberg, a senior researcher with security software company Kaspersky Lab, suggested a more James Bond approach: What I should do, he advised, is set up a specific site and get the Bosker impostor to click on the link. Once he or she has accessed this (trap) page, I’d have his or her IP address and could pinpoint his or her geographic location, and perhaps trace the IP address back to a jealous ex, hometown friend or anonymous stalker. “No one ever went broke betting on number of weird people out there on the internet," observed Kaspersky Lab PR manager Greg Sabey. I'll keep looking. In the meantime, I want to hear from you: Has this happened to you? Who was it and why? What’s your guess behind why someone would be a fake me?